A truly exceptional, renovated stone farmhouse set in a slightly elevated position in the midst of the vines with extensive views over the rural landscape. The house is decorated and furnished to a very good standard providing spacious holiday accommodation and room both inside and outside for guests to relax on their own, a particular feature being the landscaped pool area with its ornamental shrubs and paved surround. There is also private parking for up to 3 cars. The owner retains a separate apartment in the building which he may use from time to time. The ideal location for winding down and losing the stresses of everyday life, if you do tire of relaxing in this beautiful house you can walk to the pretty little village of St. Vivien-de-Monségur - visit the church then have an apéritif in the bar before enjoying a substantial meal accompanied by the patrons wine. Outdoor swimming pool (shared with the owners daughter who may occasionally use, 12m x 6m, depth 0.8m to 2.8m, open mid Jun-mid Sep weather permitting). Location: 1.5km S of St. Vivien-de-Monségur (bar, restaurants, shops, tennis), 5km SE of Monségur (historic town, most facilities), 18km NE La Réole (on River Garonne, all facilities), 35km from Casteljaloux (lake with beach, horse riding, golf). 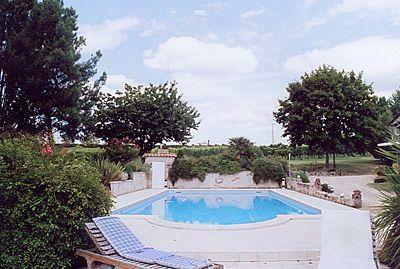 Brilliant 3 bedroom holiday home sleeping 6 near La Reole, Aquitaine. A splendid holiday villa for an unforgettable family holiday, this property offers a shared pool and has everything you\'re looking for in a holiday home! On site parking. Airport within 1 hour. Pets not accepted.